When you have a file called app_offline.htm in your website, ASP.Net will show the content of this file instead of processing all the regular stuff that should happen. What does that mean for SharePoint? We are running updates in this system. The application will be available as soon as possible. We are sorry to cause inconvenience. It’s important to place this file into the inetpub-directory. You cannot use this functionality, when you place this file into the root of a SharePoint-site using SharePoint Designer. When ASP.Net finds this file in the directory of the site, its content is sent back to the requesting client. Now, we can run our update procedure. 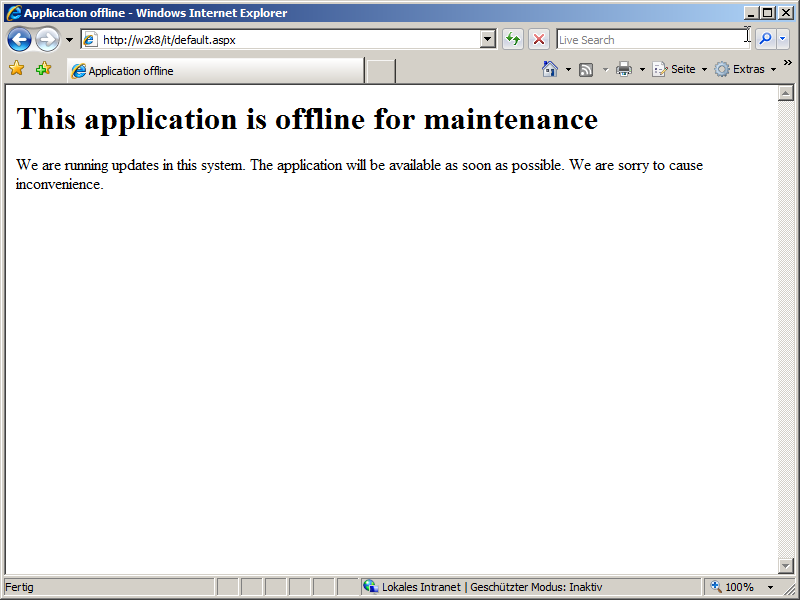 But remember, you cannot access the SharePoint site using a browser. You have to use STSADM-commands, PowerShell-cmdlets or your own commandline tools. Thank you for this article, but it would have been much more helpful had you included an explicit directory where the app_offline.htm file needs to be placed. I’ve put it in several places (including c:\inetpub\wwwroot) but to no avail).